Eric, nicknamed the Blue Hawk, his burly friend Larsen, and an Hindu boy named Sheba, discover lost civilizations, undersea cities and secret moonbases. L'Epervier Bleu was originally serialized in the weekly comics magazine "Spirou", starting in 1942. 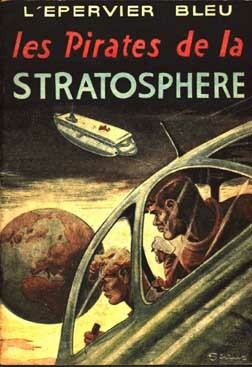 From the start, the series was in trouble with the censors because of its science fiction elements, causing Sirius to abandon it in 1954. He eventually returned to it, briefly, in the mid-1970s. 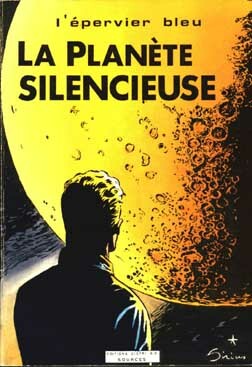 The first eight stories were collected in the graphic novel format by Dupuis -- "Spirou's" publisher -- between 1948 and 1954. Volume 1 contained an additional 39 pages that were not published in "Spirou" because of censorship! Volume 2 is extremely rare because of its low print run. Seven pages of Volume 3, initially removed, were eventually printed in Volume 4. Volume 5 was eventually reprinted in 1979, and an Omnibus edition entitled Territoires Interdits [Forbidden Territories] containing Vols. 6-8 was published in 1986. None of the later stories were collected in graphic novel format. Coffre-a-BD is reprinting the Epervier Bleu stories. The Author Sirius was the pseudonym of writer/artist Max Mayeu (1911-1997). 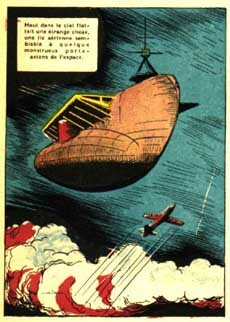 Sirius was one of the first artists to join the editorial team of "Spirou" in 1942. In 1953, after his problems with censorship, Sirius created the popular historical saga, Timour, which is still continuing today. Other creations include the short-lived fantasy Simon Le Danseur [Simon the Dancer] and the dark-humored and more cartoony Pemberton, created for "Pilote" in 1972. Epervier bleu © 2001 Sirius/Dupuis. All rights reserved.